In 1950, Mr Louis Meichtry opened a seasonal pharmacy in a room in the Joli Roc chalet; back then, there were only 27 inhabitants in the resort during the year. In 1958, the pharmacy moved to a more central location where the Cantonal Bank of Valais is currently situated, and it was open all year round. In 1972, after the death of its founder, the pharmacy moved once more to where it currently resides, in the building of the Bristol Hotel. From 1983 to 2002, the head pharmacist and owner was Mr Jean-Marc Meichtry, Louis Meichtry’s son. From 2002 to 2013, the premises were rented out to the pharmacy chain Capitole which later become Benu. 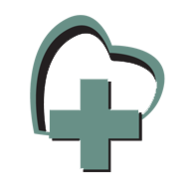 From 1st April 2013, the independent pharmacists Mr Jean-Marc Meichtry and Mr Laurent Mulin founded the Croix de Coeur pharmacy. They took over the premises with the aim of continuing to operate Verbier’s first longstanding pharmacy! 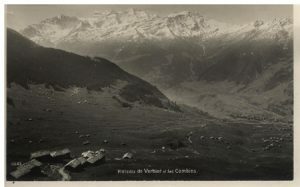 The first skiers arrived in Val de Bagnes in 1910 when Verbier, uninhabited throughout most of the year, was just a summertime mountain pasture dotted with only a few Mayen buildings. From 1925 onwards, skiers began to travel from Sembrancher to Verbier on foot (a 15 kilometre journey! ): they walked along beautiful snowy slopes which back then were still free from mechanical constructions. In 1927, Paul Fellay and Marcel Michellod gave the first ski lessons (the first ski school began in 1933). At the same time, the first hotel opened in Verbier. It wouldn’t be long before the Verbier slopes were known throughout the Valais and even in Geneva! In 1937, the Verbier Development Company was founded: “the aim of the Company was to develop the resort by promoting tourism facilities, attracting foreign tourists, and taking any necessary measures to prevent visual disfiguration of the area and to enhance the stay of guests”. 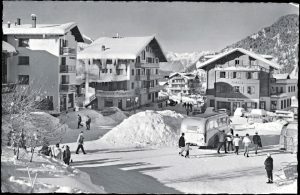 In 1945, the Federal Office of Transport considered Verbier to be “one of the sunniest places in Switzerland, with its dry and fog-free climate being of great biological and therapeutic merit”. Back then experts advised against exceeding a maximum capacity of 2,500 people! In 1946, the ‘funiluge’ was installed. Despite being the great forefather of ski lifts, this wonderful little invention didn’t appeal to its users for very long (it was too slow!). As a result, Verbier’s first ski lift was installed in 1947, measuring 250 metres in length. In 1950, the Verbier Development Company decided to link the resort of Verbier to Croix-des-Ruinettes by a chairlift: and thus, the Télésiège de Médran company was founded! The chairlift was opened in December, and the rush soon followed: skiers came from all over Switzerland. In fact, the resort experienced rapid development: fifteen years on, and Verbier was able to transport 10,000 people per hour and received nearly 25 million francs in tourism revenue! Today in Verbier, around 15 million ski lift journeys are recorded every year, compared to only 50,000 in 1951 when the first chair lift was launched. 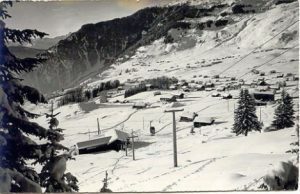 Similarly, Téléverbier now employs 300 people, while it employed just 3 in 1951. And every year, more than a million overnight stays are recorded in Verbier!